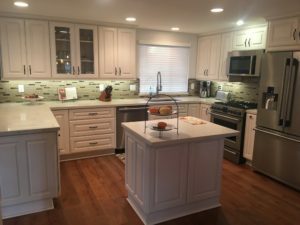 If you’ve been thinking about kitchen cabinet refacing for your Long Beach, California home, Cabinet Wholesalers is the best! We’ve been in the cabinet refacing business long enough to know it inside and out. We know that not every cabinet refacing company takes the time or care to do it right. Helping you select your door and drawer style, wood species, glazes, stains and cabinet hardware. Removing the doors, drawer fronts, hinges and hardware from your cabinets. Applying a beautiful, 1/4″ factory finished paneling to the exterior of your cabinets. Installing new factory finished drawer boxes, doors and drawer fronts. Installing crown molding above your newly refaced cabinets. To get more information about cabinet refacing from Cabinet Wholesalers in Long Beach, contact us today. Learn more about all the kitchen remodeling services we have available and how we can create the kitchen you’ve been dreaming of.